Many people have opted for tattoos over the years that have later led to regrets. From the name of a former partner to an aesthetic design you’ve simply outgrown, you may look upon a once-beloved tattoo as an unwanted reminder. Because tattoos are inked into the skin, they are often considered a permanent change that cannot be undone. However, laser tattoo removal NYC can make a real change, clearing your skin of the unwanted design and restoring your skin’s appearance to its original state. You can turn your unwanted tattoo into a forgotten memory with laser tattoo removal. While results may vary from person to person, our advanced laser treatments can restore the natural appearance of your skin without painful surgical procedures. Our cutting-edge Q-switched lasers are designed for ultimate tattoo removal and incredible success in restoring your appearance. 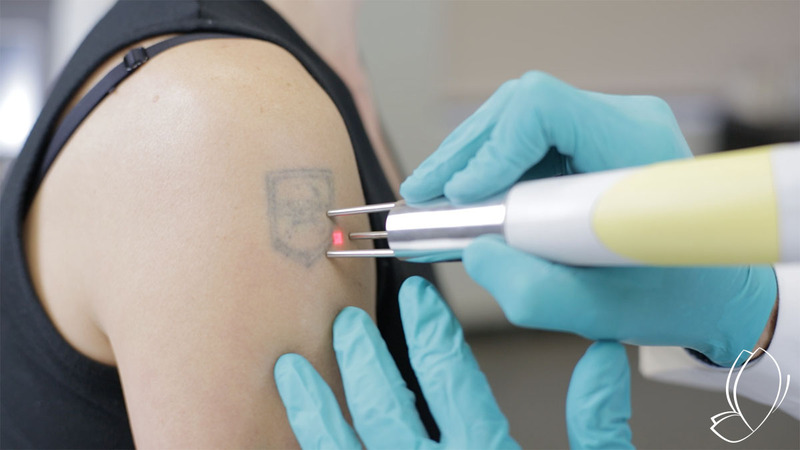 Our skilled experts will select the right laser wavelengths for the color of your tattoo and your skin type and tone to achieve the best results possible. Our specialized treatments are designed to help you revisit your old tattoos and present a clean slate. Whether your old tattoos are incompatible with your career or profession, you’ve simply changed your taste or you want to celebrate a new relationship rather than old memories, laser tattoo removal can make your wishes for a natural skin appearance come true. Laser tattoo removal will progressively eliminate the ink of an unwanted tattoo from your skin. With this treatment, you can restore the natural appearance of your skin and eliminate old tattoos that accompany bad memories, a previous look or a different body shape. Laser tattoo removal is safe and effective and is designed to protect healthy skin cells, leaving behind a natural look and no scarring. Minimal recovery time is necessary, and our experts will provide proper instructions for aftercare to help ensure great results from your laser procedure. Our medical spa uses the most advanced, industry-standard lasers for tattoo removal with a specialized technique known as Q-Switching. With Q-Switched lasers, short pulses of intense laser light – measured in billionths of a second – enter through the top layers of your skin. There, the tattoo pigment absorbs these intense light pulses designed to fragment the ink into small particles. The ink particles are absorbed easily by the body’s immune system and eliminated from your body. Treatment includes multiple sessions and generally requires more than four sessions to eliminate a tattoo from the skin with laser removal. These sessions should be spaced apart by four to eight weeks for maximum effects. Your particular, personalized treatment protocol will be determined by our experts based on the color and size of your tattoo, the amount of ink used and the depth of ink penetration into your skin. Every tattoo is different, and our custom laser tattoo removal NYC treatments will be designed particularly to target your unique tattoo and skin type. Laser tattoo removal is often compared to the feeling of receiving a tattoo; however, laser sessions are designed to take place very quickly. We can work with you to maximize your comfort throughout the procedure. Discomfort also fades with ongoing treatment. The length of each treatment session depends on the size of the tattoo, from only a few minutes for a very small tattoo for up to an hour for an extra-large piece. Tattoo removal generally requires multiple sessions spaced four to eight weeks apart for the best possible result. You will see the tattoo fade with each treatment. The final outcome will include a slight frosting of the skin that will subside following the treatment completion. You may experience mild swelling and redness that will fade within 72 hours. Our experts will provide you with directions for proper aftercare. Laser tattoo removal generally requires four or more sessions. The number of sessions depends on the size and color of your tattoo and will be determined based on your unique needs. You will begin seeing results, including fading and reduction of tattoo appearance, following your first session. The reduction of your tattoo’s appearance will increase with every subsequent session.